Fully functional T cells play a central role in activating Mycobacterium tuberculosis (MTB)-engulfed macrophages, which are responsible for directly eliminating MTB. At the early stage of MTB infection, alveolar macrophages (AMs), after phagocytizing MTB, cannot effectively kill MTB only by themselves., During the stage of adaptive immune response, the effector CD4+ and CD8+ T cells can effectively activate and promote AM to eliminate MTB. However, MTB is hard to be eradicated due to lack of continual effector T cell responses. The coinhibitory molecules, also known as the immune checkpoints, such as programmed death-1 (PD-1), cytotoxic T lymphocyte-associated antigen-4, T cell immunoglobulin domain and mucin domain-3 (TIM-3), and B and T lymphocyte attenuator (BTLA), mediate T cell dysfunction during chronic infection and tumoral progression., These immune checkpoints are usually upregulated on T cells of patients with chronic infections or bearing tumors, resulting in T cell exhaustion. Whereas blocking these immune checkpoints with antibodies can partially restore T cell function. Currently, PD-1 and TIM-3 have been described as exhaustion markers on T lymphocyte surface in pulmonary tuberculosis (PTB) infection and biomarkers of the efficacy of chemotherapy for tuberculosis. BTLA (CD272), an immune checkpoint belonging to Ig superfamily, contains an immunoreceptor tyrosine-based switch motif and an immunoreceptor tyrosine-based inhibitory motif in the intracellular domain. BTLA inhibits T cell activation and proliferation through interacting with its unique ligand herpesvirus entry mediator (HVEM). BTLA overexpression has been reported to result in T cell exhaustion from patients with chronic virus infections and bearing tumors.,, However, the dynamics of BTLA expression on T cells of PTB patients and its association with clinical parameters remain to further exploration. Thereby, in the current study, we examined BTLA expression on peripheral CD4+ and CD8+ T cells from patients with PTB and analyzed its association with clinical indicators. Our data showed that BTLA expression was increased on both CD4+ and CD8+ T cells of PTB patients and correlated with PTB progression. PTB patients with smear positivity (n = 86) and healthy donors (n = 40) were enrolled in this study. All PTB patients were diagnosed by laboratory markers and computed tomography (CT)-acquiring images according to Diagnostic Criteria for Pulmonary Tuberculosis in China (WS288–2008). All recruited patients were excluded from diabetic complication, human immunodeficiency virus coinfection, and other diseases. [Table 1] described demographic and clinical characteristics of study subjects. The study was conducted at The Affiliated Infectious Hospital of Soochow University and approved by the Ethics Committee of the hospital. Examination of bacillary load in sputum of PTB patients was conducted according to the laboratorial regulations of diagnostic bacteriology based on Diagnostic Criteria for Pulmonary Tuberculosis in China (WS288–2008). The patients with sputum smear positivity were included, otherwise excluded. The standard of quantitative analysis of smear positivity for acid-fast bacilli was according to Diagnostic Criteria for PTB in China (WS288–2008). Briefly, define 3∼9 cells per 300 visual fields as “1 +”, 1∼9/100 visual fields as “2 +”, 1∼9 cells/visual fields as “3 +,” and ≥10 cells/visual fields as “4 +”. The cases with PTB sputum positivity were categorized into four groups on the basis of bacillary load/acid-fast bacilli in sputum (1 +, n = 22; 2 +, n = 23; 3 +, n = 20; and 4 +, n = 21). Diagnostic Kit (Nanjing Potomac Bio-Technology, China) was used to determine IgG Antibodies to M. tuberculosis (Protein Chip). The measurement of antibodies to MTB antigens is according to the standard protocol. Detection of any antibody was considered as a positive result (+), otherwise as a negative result (−). Based on the cavity lung lesions present on CT-acquiring images, PTB patients were grouped into patients without lung cavity and patients with lung cavity. The peripheral blood samples from PTB patients and healthy control (HC) were gathered for determining BTLA expression on CD4+ or CD8+ T cells using flow cytometry. Briefly, 50 μL freshly heparinized whole blood from HC or PTB patients was incubated with anti-CD3-APC and anti-BTLA-PE, simultaneously stained with anti-CD4-Per CP or anti-CD8-Per CP for 15 min, then lysed with fluorescence-activated cell sorting (FACS)™ lysing solution (BD Biosciences, San Jose, CA, USA). The lysed blood sample was washed with phosphate-buffered saline, fixed, and eventually determined by FACS (BD FACSAria with DB FACS-Diva software supporting). All antibodies except for anti-BTLA-PE were purchased from BD PharMingen (San Diego, CA, USA). Anti-BTLA antibody was prepared in our Lab. Data were analyzed using FlowJo (Tree Star Inc., San Carlos, CA, USA). GraphPad Prism 6.0 software (GraphPad, San Diego, CA, USA) was used to analyze data and the results were presented as mean ± standard error of the mean. Unpaired t or one-way ANOVA test was performed to assess the difference between two different groups or differences between multiple groups and a two-tailed P < 0.05 was considered statistically significant. Since upregulation of BTLA leads to CD4+ T cell anergy, here we examined BTLA expression on CD4+ T cells of PTB patients. Interestingly, compared with HC (n = 40), the level of BTLA expression on circulating CD4+ T cells of PTB patients (n = 86) was significantly increased (P < 0.0001) [Figure 1]a and [Figure 1]b. Thereby, our data demonstrated that BTLA, with similarities to PD-1 in tuberculosis and TIM-3 in chronic hepatitis C virus infection,, was significantly upregulated on CD4+ T cells and might be involved in inhibiting MTB-specific CD4+ T-cell functions. PTB patients with retreatment had a lower cellular immune function as compared to those with initial treatment. We found that the level of CD4+ T cell-expressing BTLA in patients with retreatment (n = 38) was obviously higher than that in patients with initial treatment (n = 48) (P = 0.0076) [Figure 2]a, indicating that upregulation of BTLA might contribute to decrease of CD4+ T cell function. 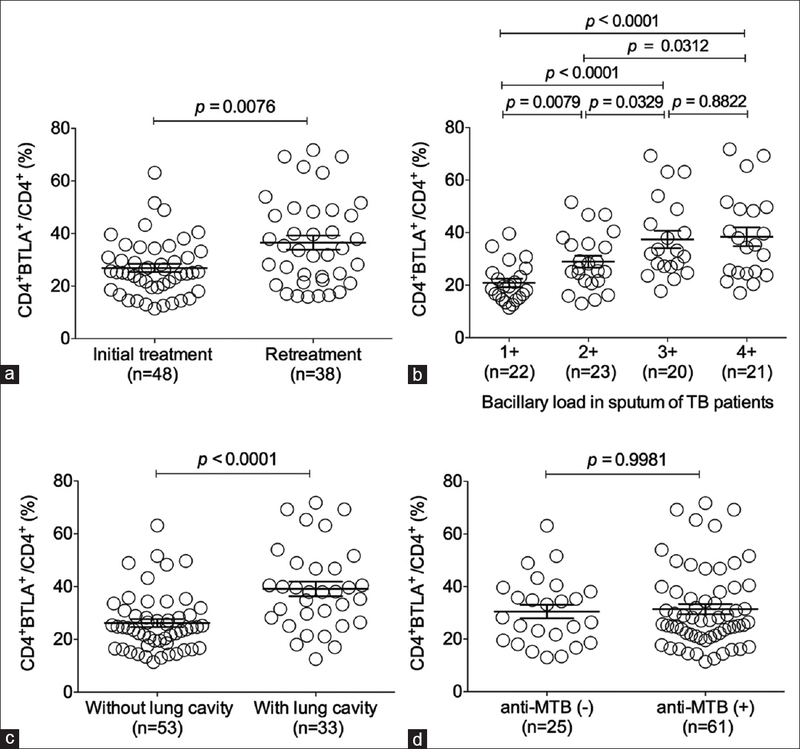 In tuberculosis, MTB load in patients is reversely associated with immune function. Our data showed that the percentage of BTLA expression on CD4+ T cells was gradually upregulated along with the increase of bacillary load. Patients with high bacillary load (3 + and 4 +), respectively, presented a significant higher percentage of BTLA expression than those of lower bacillary load (1 + and 2 +) and patients with a 2 + bacillary load also had an obvious higher percentage of BTLA expression than those of 1 + bacillary load [Figure 2]b. Our investigation further substantiated that PTB patients with lung cavity had higher percentage of BTLA expression on CD4+ T cells than those without lung cavity [Figure 2]c, suggesting that BTLA-mediated inhibition of CD4+ T cell function might be in favor of PTB progression. 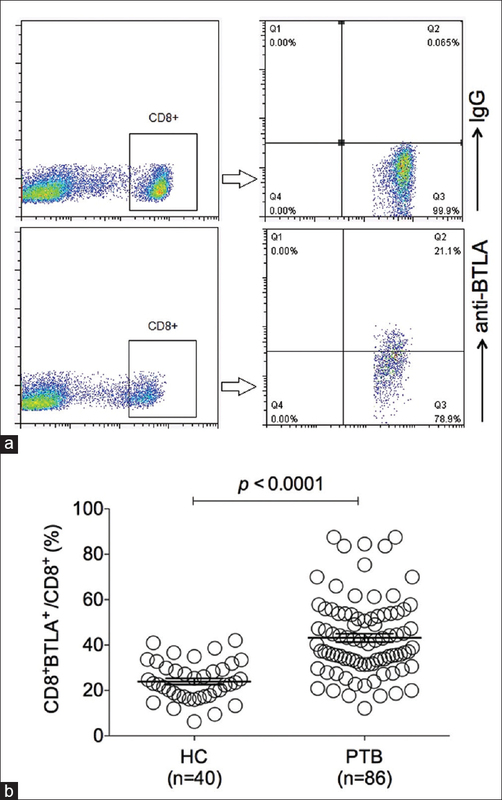 In addition, it was demonstrated that there was no difference of the percentage of BTLA expression on CD4+ T cells between the two cohorts of patients with positivity or negativity of antibody to MTB [Figure 2]d.
The finding of BTLA upregulation on CD8+ T cells of PTB patients encouraged us to further analyze the association of BTLA expression on CD8+ T cells with PTB clinical parameters. First, we found that the level of BTLA on CD8+ T cells in patients with retreatment (n = 38) was obviously higher than that in patients with initial treatment (n = 48) (P = 0.0015) [Figure 4]a. 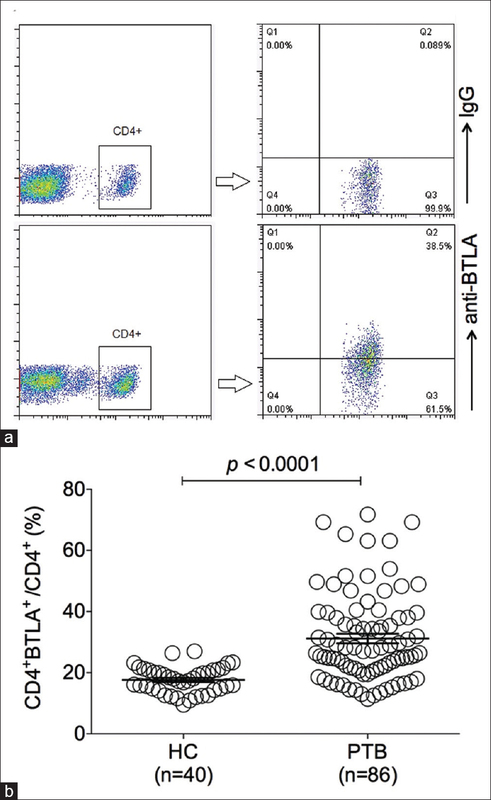 Second, the percentage of BTLA expression on CD8+ T cells, similar to that on CD4+ T cells, was also gradually upregulated along with the increase of bacillary load [Figure 4]b. 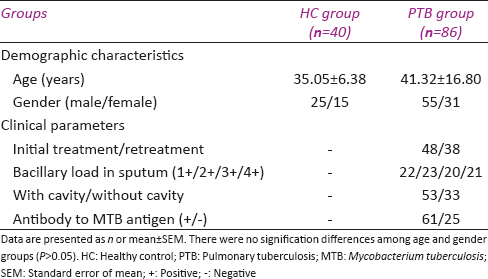 Third, we proved that PTB patients with lung cavity had higher percentage of BTLA expression on CD8+ T cells than those without lung cavity [Figure 4]c. Similarly, we could not found a significant difference of the percentage of BTLA expression on CD8+ T cells between the two cohorts of patients with positivity or negativity of antibody to MTB [Figure 4]d. Taken together, we substantiated that BTLA expression on CD8+ T cells presented the same association with clinical parameters as that on CD4+ T cells, indicating that BTLA exerts a same inhibitory effect on CD4+ and CD8+ T cells during PTB development. As one member of checkpoint molecules, BTLA inhibits T cell proliferation and IFN-γ production. Currently, BTLA has been reported to be upregulated on tumor-specific CD8+ T cells and intrahepatic T cells during the chronic hepatitis B infection, while blockade of BTLA/HVEM coinhibitory signal can significantly restore the capacity of T cell producing IFN-γ., However, the dynamics of BTLA expression on T cells of PTB patients and its clinical significance remain further exploration. In the current study, we revealed that BTLA was upregulated on both CD4+ and CD8+ T cells of PTB patients compared with HC. It has been reported that upregulation of immune checkpoints such as PD-1 and TIM-3 on T cells attributes to persistent stimulation of viral antigens., Here, we supposed that the increased expression of BTLA on T cells might also result from the persistent existence of MTB antigens, accordingly mediated immunosuppression of T cells and subsequently contributed to PTB progression. However, the mechanism remains to further investigation. Although there is substantial evidence that CD4+ T cells have a dominant role in the control of tuberculosis, accumulating data have demonstrated that CD8+ T lymphocytes are involved in the immune response against MTB. Our finding of upregulation of BTLA on CD8+ T cells addition to CD4+ T cells suggested that arrest of CD8+ T cell function mediated by BTLA upregulation might be in favor of PTB progression. 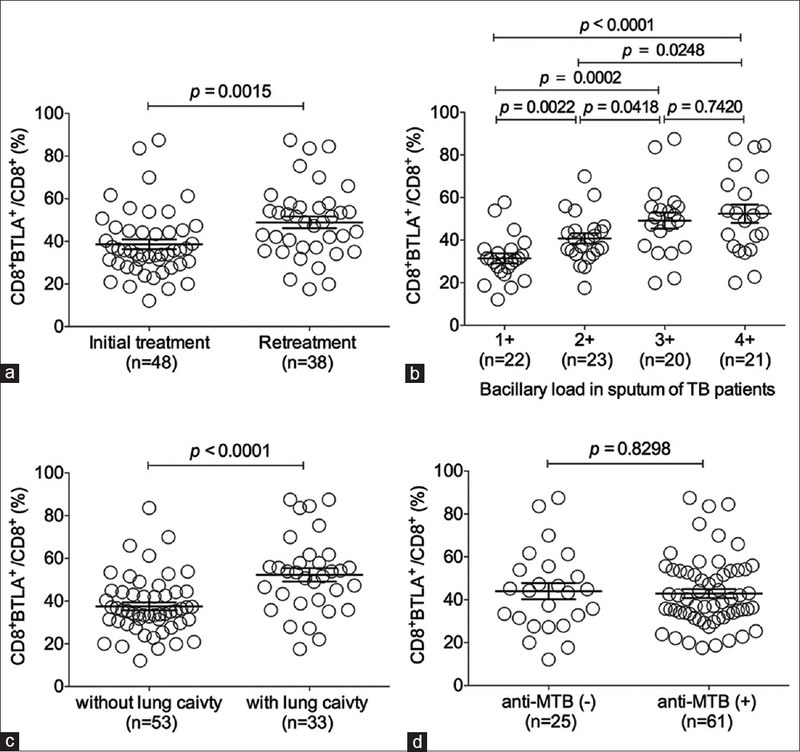 In addition to T lymphocytes, antigen-presenting cells in patients with active tuberculosis manifest an increased expression of BTLA and exhibit low capacity to stimulate T cell proliferation, suggesting that BTLA can suppress immune responses against MTB through multiple aspects of mechanisms. Previously, Zeng et al. demonstrated that BTLA expression was decreased on T cells of patients with MTB infection. The inconsistency between their and our findings of BTLA expression probably lies in aspects as follows: first, in our study, only the patients with smear positivity were recruited, while they included partial patients with smear negativity. Then, in their study, all the patients were received treatment with antituberculosis drugs 0∼4 days or 20∼40 days before determination of BTLA expression, whereas we measured BTLA expression on T cells of PTB patients before they received initial treatment or retreatment. Interestingly, in their study, patients undergone drug treatment for 20–40 days showed an increased BTLA expression on CD8+ T cells, implying that the temporary treatment with antituberculosis drugs might restore T cell function from exhaustion through downregulating BTLA and the recrudescence of PTB after treatment would relate to upregulation of BTLA. Immunosuppression of T cells will result in quiescence of macrophages, the major immunocytes responsible for eradicating MTB directly, leading to exacerbation of MTB infection. Thereby, the findings of BTLA upregulation on both CD4+ and CD8+ cells encouraged us to further investigate its relevance to clinical parameters. First, our results of analysis demonstrated that the level of BTLA expression on circulating T cells of patients with retreatment was obviously higher than that in patients with initial treatment, which is consistent with the previous report that PTB patients with retreatment have lower cellular immune function as compared to those with initial treatment. Then, we found that the percentage of BTLA expression on both CD4+ and CD8+ T cells was gradually upregulated along with the increase of bacillary load, which potentially reflected that, in tuberculosis, MTB load in patients was reversely associated with immune function. At the same time, these data indicated that persistent bacterial load driven BTLA upregulation on T cells, or immunosuppression of T cells triggered by BTLA expression led to high bacillary load. In addition, our investigation substantiated that PTB patients with lung cavity had a higher percentage of BTLA expression on both CD4+ and CD8+ T cells than those without lung cavity, indicating that inhibition of T cell function mediated by overexpression of BTLA exacerbated PTB progression. However, we could not found that there was a difference of the percentage of BTLA expression on both CD4+ and CD8+ T cells between the two cohorts of patients with positivity or negativity of antibody to MTB, suggesting that existence or absence of antibody to MTB was not associated with T cell function in PTB. Therefore, the level of BTLA expression on CD4+ and CD8+ T cells of PTB patients can be considered as a useful marker reflecting immune function as well as disease progression in that it obviously associates with a series of clinical parameters in PTB. Further, it can be utilized as a valuable therapeutic target for PTB through blocking BTLA inhibitory signal to restore T cell function by using agonistic antibody of BTLA. Our current study substantiated that BTLA expression manifested a significant increase on both CD4+ and CD8+ T cells of PTB patients and was associated with clinical parameters. Thereby, BTLA expression on peripheral CD4+ and CD8+ T cells can be considered as a potential clinical indicator and further utilized as a valuable therapeutic target for PTB. This research was supported by the National Natural Science Foundation of China (31570889, 91642103), a project Funded by the Priority Academic Program Development of Jiangsu Higher Education Institutions, Jiangsu Youth Medical Talents Project (QNRC2016226), the Project of Scientific and Technical Development of Suzhou (SS201541, SS201656, LCZX201514), and the Project of Jiangsu Province Association of Preventive Medicine Scientific Research (Y2013023) and Six talent peaks project in Jiangsu Province (2017-SWYY-065). O'Garra A, Redford PS, McNab FW, Bloom CI, Wilkinson RJ, Berry MP, et al. The immune response in tuberculosis. Annu Rev Immunol 2013;31:475-527. Divangahi M, King IL, Pernet E. Alveolar macrophages and type I IFN in airway homeostasis and immunity. Trends Immunol 2015;36:307-14. Dey B, Bishai WR. Crosstalk between Mycobacterium tuberculosis and the host cell. Semin Immunol 2014;26:486-96. Jasenosky LD, Scriba TJ, Hanekom WA, Goldfeld AE. T cells and adaptive immunity to Mycobacterium tuberculosis in humans. Immunol Rev 2015;264:74-87. Fourcade J, Sun Z, Pagliano O, Guillaume P, Luescher IF, Sander C, et al. CD8(+) T cells specific for tumor antigens can be rendered dysfunctional by the tumor microenvironment through upregulation of the inhibitory receptors BTLA and PD-1. Cancer Res 2012;72:887-96. Schietinger A, Greenberg PD. Tolerance and exhaustion: Defining mechanisms of T cell dysfunction. Trends Immunol 2014;35:51-60. Pauken KE, Wherry EJ. Overcoming T cell exhaustion in infection and cancer. Trends Immunol 2015;36:265-76. Henao-Tamayo M, Irwin SM, Shang S, Ordway D, Orme IM. T lymphocyte surface expression of exhaustion markers as biomarkers of the efficacy of chemotherapy for tuberculosis. Tuberculosis (Edinb) 2011;91:308-13. Watanabe N, Gavrieli M, Sedy JR, Yang J, Fallarino F, Loftin SK, et al. BTLA is a lymphocyte inhibitory receptor with similarities to CTLA-4 and PD-1. Nat Immunol 2003;4:670-9. Sedy JR, Gavrieli M, Potter KG, Hurchla MA, Lindsley RC, Hildner K, et al. Band T lymphocyte attenuator regulates T cell activation through interaction with herpesvirus entry mediator. Nat Immunol 2005;6:90-8. Cai G, Nie X, Li L, Hu L, Wu B, Lin J, et al. Band T lymphocyte attenuator is highly expressed on intrahepatic T cells during chronic HBV infection and regulates their function. J Gastroenterol 2013;48:1362-72. Mittal R, Wagener M, Breed ER, Liang Z, Yoseph BP, Burd EM, et al. Phenotypic T cell exhaustion in a murine model of bacterial infection in the setting of pre-existing malignancy. PLoS One 2014;9:e93523. Wang XF, Chen YJ, Wang Q, Ge Y, Dai Q, Yang KF, et al. Distinct expression and inhibitory function of B and T lymphocyte attenuator on human T cells. Tissue Antigens 2007;69:145-53. Hurchla MA, Sedy JR, Gavrieli M, Drake CG, Murphy TL, Murphy KM, et al. Band T lymphocyte attenuator exhibits structural and expression polymorphisms and is highly induced in anergic CD4+ T cells. J Immunol 2005;174:3377-85. Shen L, Gao Y, Liu Y, Zhang B, Liu Q, Wu J, et al. PD-1/PD-L pathway inhibits M.tb-specific CD4+ T-cell functions and phagocytosis of macrophages in active tuberculosis. Sci Rep 2016;6:38362. Golden-Mason L, Palmer BE, Kassam N, Townshend-Bulson L, Livingston S, McMahon BJ, et al. Negative immune regulator Tim-3 is overexpressed on T cells in hepatitis C virus infection and its blockade rescues dysfunctional CD4+ and CD8+ T cells. J Virol 2009;83:9122-30. Zhang SJ, Xiao HP. Changes and significance of peripheral blood T cell subsets, soluble interleukin-2 receptor and interferon-gamma in patients with retreatment pulmonary tuberculosis and initial treatment tuberculosis. Zhonghua Jie He He Hu Xi Za Zhi 2011;34:884-7. Lin PL, Flynn JL. CD8 T cells and Mycobacterium tuberculosis infection. Semin Immunopathol 2015;37:239-49. Haymaker C, Wu R, Bernatchez C, Radvanyi L. PD-1 and BTLA and CD8(+) T-cell “exhaustion” in cancer: “Exercising” an alternative viewpoint. Oncoimmunology 2012;1:735-8. Barathan M, Mohamed R, Vadivelu J, Chang LY, Vignesh R, Krishnan J, et al. CD8+ T cells of chronic HCV-infected patients express multiple negative immune checkpoints following stimulation with HCV peptides. Cell Immunol 2017;313:1-9. Derré L, Rivals JP, Jandus C, Pastor S, Rimoldi D, Romero P, et al. BTLA mediates inhibition of human tumor-specific CD8+T cells that can be partially reversed by vaccination. J Clin Invest 2010;120:157-67. Pasero C, Olive D. Interfering with coinhibitory molecules: BTLA/HVEM as new targets to enhance anti-tumor immunity. Immunol Lett 2013;151:71-5. McMahan RH, Golden-Mason L, Nishimura MI, McMahon BJ, Kemper M, Allen TM, et al. Tim-3 expression on PD-1+HCV-specific human CTLs is associated with viral persistence, and its blockade restores hepatocyte-directed in vitro cytotoxicity. J Clin Invest 2010;120:4546-57. D'Souza M, Fontenot AP, Mack DG, Lozupone C, Dillon S, Meditz A, et al. Programmed death 1 expression on HIV-specific CD4+T cells is driven by viral replication and associated with T cell dysfunction. J Immunol 2007;179:1979-87. Wang WD, Gao YC, Lu YB, Zhang JA, Liu GB, Kong B, et al. BTLA-expressing CD11c antigen presenting cells in patients with active tuberculosis exhibit low capacity to stimulate T cell proliferation. Cell Immunol 2017;311:28-35. Zeng JC, Lin DZ, Yi LL, Liu GB, Zhang H, Wang WD, et al. BTLA exhibits immune memory for αβ T cells in patients with active pulmonary tuberculosis. Am J Transl Res 2014;6:494-506.